Wadi Hanifa, which was formerly called Al-Irdh, has its current name from Banu Hanifa, the Arab tribe who used to live in the area. It is located in the Nejd region, Riyadh Province, in central Saudi Arabia, many tribes working in agriculture, trade and some other handcrafts settled on its banks since a long time. The valley has a group of tributaries such as the Al-Witer valley (currently called Batha), Allaisn valley, Sdoada Safar, Shoaib (Almchaabah), Abo Rafee, Shoaib Laha, Suli valley and Laban valley, it flows into Alsahba valley in Al-Kharj. It is considered one of the oldest resided valleys in Najd area in addition to Al-Kharj Valley, because of the fertility of its lands. The valley is divided into five sections,and you find some communities on the sides of the valley working in agricultural activities such as nurseries, palm groves, grains, vegetables and fruits, as well as archaeological facilities, wells and dams. Wadi Hanifa is one of the largest and longest valleys in the Kingdom, it runs for a length of 80 km from the north of Prince Salman Street until the south in Hayer, its depth ranges between 10 to 100 meters, and its width ranges between 100 to 1000 meters. Wadi Hanifa is one of the best touristic places as it contains stunning natural scenery of trees and running water. The valley contains many trees, shrubs and desert herbs that are commensurate with its nature, around 30,000 desert trees and 7,000 palm trees were planted in the parks and walkers’ paths, around 2,000 desert trees were transferred to areas poor with plants and other natural plants and trees were planted and distributed there such as acacia and tamarisk trees. in addition to more than 42 shrubs planted from ready seeds. The running water channel was designed in the form of an open trench, around 1.5 m deep going from north to south. The channel goes from the north of Araka area towards the south where Hayer lakes, it is fed with water coming from sidal stems and sub-channels. It has some rock formations in the stream that work as natural water ripplers, around 83 ripplers are distributed in the channel to exceed the speed of the water and assist the process of water purification in the valley. 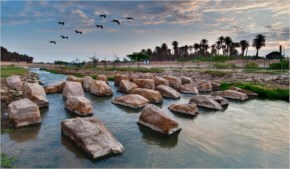 Wadi Hanifa includes six open parks, which are Sud Al-Elb Park which has a pedestrian path of 5.5 km, and has 93 hikers’ seats and car parking along the road for up to 200 cars, in addition to 2 km paved path provided with lights and trees, Sud Wadi Hanifa Park featuring 27 hikers’ seats and a 5.6 km long pedestrian corridor, Bio Treatment Park in Otaiqah which contains 52 seats for hikers and 1,100 meters long pedestrian corridor, Sud Park which has a lake with area of about 10 thousand square meters and up to two meters deep, the dam is surrounded with 4.5 km paved pedestrian paths, and hikers’ seats were fixed around the lake. Factories Lake Park which includes 4 km pedestrian paths, and 22 seats for hikers. The lake has an area of 40,000 square meters, and its depth is up to 10 meters. Also there is Jaz’a Lake Park which has 5.5 km of pedestrian paths and was provided with 37 hikers’ seats, while the lake has an area of about 35,000 square meters and it’s depth is up to three meters.